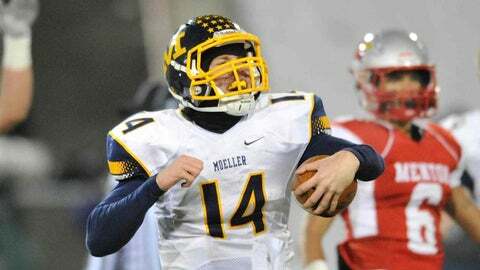 Moeller quarterback Gus Ragland celebrates after running for a touchdown in the fourth quarter against Mentor in the Ohio Division I high school football championship game Saturday, Dec. 7, 2013, in Canton, Ohio. Safe to say Gus Ragland has had a pretty good December. The Cincinnati Moeller quarterback started it by leading the Crusaders to their second consecutive Ohio Division I state championship, and now he has a home for the next four years thanks to a verbal commitment to Miami University. Per Dave Berk of Scout.com, new RedHawks head coach Chuck Martin became the first FBS head coach to offer Ragland a scholarship, and the three-star prospect accepted Friday afternoon. The 6-3, 205-pound Ragland was sensational in the state championship game victory over Mentor earlier this month when he completed 12 of 13 passes for 273 yards and three touchdowns. He also ran for 189 yards and five touchdowns in the Crusaders’ 55-52 victory.